If an organization doesn’t strive to become better, faster, and more productive, it will inevitably lose its way. Process improvement is critical to learning the true voice of your customer, eliminating waste, enhancing quality, and differentiating yourself from your competition. Your business can stand still and experience an ever-deepening performance gap or realize an ever-increasing competitive edge through continuous improvement processes. 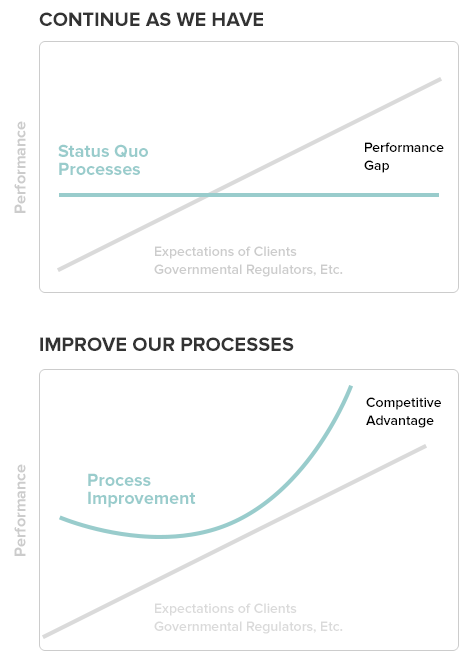 Competition for legal services is fierce, and law firms and legal departments such Seyfarth Shaw, DuPont, GE, and Motorola have successfully used process improvement to their competitive advantage. We are certified in Legal Lean Sigma, a dynamic change methodology used to improve the processes by which legal services are delivered. We assist you in eliminating distractions and waste, allowing you to focus time and resources on activities that add value to your business and redefine your competitive advantage.